Cé Hé Sin posted earlier but after watching it, I’d like to draw further attention to the programme. A very welcome return, it’s like an informative TG segment without the buffoonery (or The Buffoon). Illustrates the decline of the UK/US car industries and the corresponding rise of Germany and Japan. I couldn’t see it on BBC America’s schedule. No doubt it’ll pop up on a torrent/YouTube. 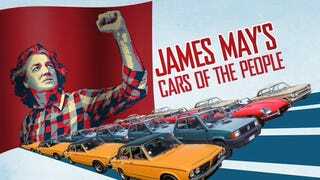 James May is back on the BBC in just over half an hour doing his “Cars of the People” again. I played Initial D Stage Zero Arcade in Seoul so you don’t have to.